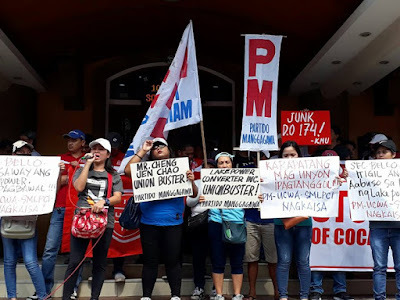 Women workers of the electronics firm Lakepower in the Cavite ecozone held a protest today at the DOLE main office to call on Labor Secretary Silvestre Bello to intervene and resolve the protracted dispute. The Lakepower workers have been on strike for more than two months now. The strike commenced after management refused worker’s demands that the termination and suspension of union officers and members be stopped. The rally is also part of a series of protests by labor groups who are calling for the signing of an executive order to abolish contractualization and action by the DOLE on labor disputes at Lakepower, Coke and Philippine Airlines. The DOLE main office will also be the site of rallies on February 23 (Friday) by KMU and on February 26 (Monday) by the Nagkaisa labor coalition. The strike has dragged on as management has refused to take back the workers unless they are subjected to disciplinary action for taking part in the strike. Management has hired striker replacements since the strike began and continues to operate. Immediately after the strike started last December 7, the striking women workers were repeatedly harassed by company and ecozone guards. Company guards, export zone security guards and other men wearing ski masks but clad in ecozone police uniforms repeatedly tore down placards and makeshift tents at the picketline. Two women workers—Maricar Orque and Magdalena Peña—were hurt in the commotion that followed the forcible dismantling of the picketline. Unrest has festered at Lakepower since last year. Among workers grievances is the removal of the door of the women’s restroom so that the company can spy on workers. Almost all of the 200 workers in the factory are women. They are also outraged at the unreasonable limits on the use of the restroom which has led to numerous cases of workers suffering from urinary tract infection. Workers also complained of excessive quota and the exclusion of unionists from receiving Christmas packages. Workers formed a union in June last year in a bid to resolve various workplace grievances such as verbal harassment, health and safety, and excessive quota. In response, management interrogated workers individually regarding their union activity. Union leaders were given new work assignments and overtime work was denied unionists and instead given to contractual employees. Three line leaders were forced to resign since they were suspected union supporters.